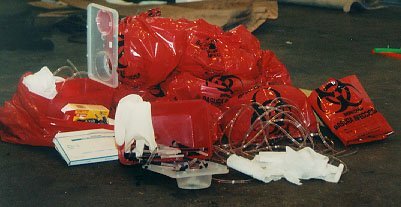 On the Federal level, the storage and management of medical waste is primarily regulated by OSHA. The OSHA regulations only apply to human blood, human infectious wastes, and human pathological wastes. labels affixed to containers of regulated wastes, refrigerators and freezers containing blood or other potentially infectious materials, and other containers used to store, transport, or ship blood or other potentially infectious materials must: include the biohazard symbol, be fluorescent orange or orange-red or predominantly so, with lettering and symbols in contrasting color; and affixed as closely as possible to the container by adhesive or wire to prevent loss or removal. States often expand the definition of medical waste or blood to include animals. State-by-state guidance concerning regulated medical waste can be found at ENVCAP's Regulated Medical Waste Resource Locator. State-by-state guidance concerning mercury-containing equipment or products and/or mercury spills can be found at ENVCAP's Mercury Resource Locator.